OCC Lip Tar may well be one of the most well known ‘cult’ products as far as lip products go, and I’ve been soo excited to try these out. I crawled the internet looking for swatches and photos to find the perfect shade for me. Problem there is just too many shades available and I don’t do well with options. Anyway I settled for three shades but today I wanted to show you #Divine – a pale and cool toned pink. I really wanted to fall in love with these lip tars, however I may be the first in history to think that they’re a bit, dare I say it … tricky to use? Anyhow I thought I’d break down what I thought for you guys. Cult lip product from David Klasfeld and Obsessive Compulsive Cosmetics. The lip tar from OCC is an opaque liquid lipstick which applies like a gloss but has the durability of a lipstick and dries to a satin finish. This stuff is seriously pigmented and a little really goes a long way! I found applying with a lip brush is the easiest and give the best looking result. The Lip tar can also be mixed with other shades to create you own colours or effects. The consistency is what I am struggling with the most, the stuff is so runny! I find it quite tricky to apply it without it transferring everywhere. I managed to make such a mess, it was literally all over my hands, fingers, and face haha! However it was easy enough to tidy up with some concealer and brush however I wouldn’t recommend whipping this bad boy out for touch ups in public. Lip tars doesn’t really smell of anything in particular which is something I appreciate. If it had a scent as powerful as the colour I don’t think I’d be able to cope. As the product description describes, the lip tars go on like a gloss and dries to a satin like finish. At first it looks a bit wet and glidey (is that a word?) but once dry, it stays on quite nicely. I found that blotting it with tissue really helps to speed the process along and helps to minimise the feathering and mess. I did find that when it dried the consistency felt a little bizarre, it’s the in-between a lipstick and a gloss. Only way I can describe is that it feels a little bit like when you apply a gloss over a lipstick and then blotted. It’s a little sticky but nothing I’m not used to as I tend to favour lip glosses. Lip tar in shade #Divine in particular is cooled toned pink that would suit peachy or paler skin tones in my opinion. Against my yellow-toned skin it kinda just looks a tad garish and washes me out. I did however loved using this as a cream blusher, it gives a lovely glowing complexion and only a teeny bit of product covers you for both lips and cheeks! I am a little disappointed with this “cult” product, I really had bought into the hype on this one. Perhaps I need to practice a bit more with it. I do find it a bit fussy and it’s not something that I’m finding myself reaching for daily. Other than application and the runny formular, I do love that you can mix and match colours and multi use as a blusher or eyeshadow base. I purchased my OCC LIP TARS from Cocktail Cosmetics for £11.95. Many shades available. Have you tried any of the OCC Lip tars? What did you think of this “Cult Beauty” product? 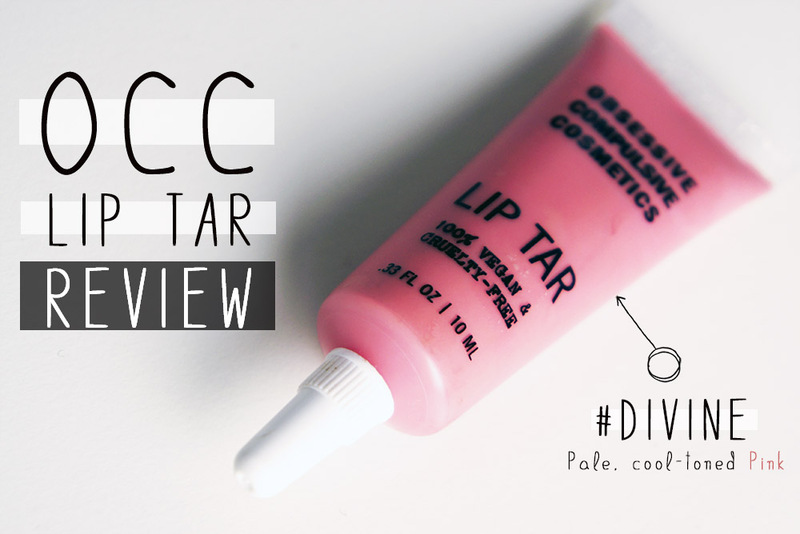 Tags: DIVINE, LIP TAR, Lips, OBSESSIVE COMPULSIVE COSMETICS, OCC, review, Swatches. Bookmark the permalink. ooooooh this looks amazing! I wana borrow! This is on my list (a long one LOL) and I saw that there was a set last time sold on Sephora. This color looks absolutely stunning on you Kamen and the outfit goes very well with it, too!